Given the uncertainty over the property market, we decided to investigate whether or not 2019 is the best time to step onto the property ladder. With the financial gap between renting and buying becoming closer than ever, and ‘Generation Rent’ further away from entering the property market than ever before, many of us are left feeling confused as to whether stepping onto the ladder is a financially-savvy move to make. Should we step off the property ladder? At a time where most young people reach the age where buying their first home is almost expected of them, is it really a financially sound decision? In terms of money spent, stepping off the ladder could save you a whopping 43% off your budget for day-to-day living costs! We started our research by looking at monthly housing expenses data from the National Office of Statistics. 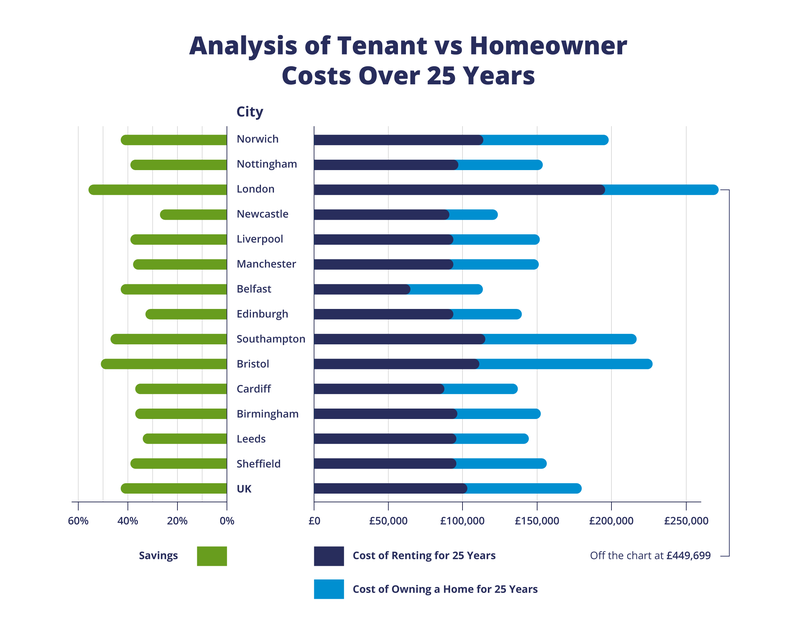 Then, we spoke to 2,000 British homeowners and renters and asked them just how much they spent on moving costs and maintenance over a 25-year period. While stepping onto the property ladder has the well-known costs of finding a deposit, the real savings for renters were found in the absence of home maintenance, decorating, and insurance costs over the lifetime of a mortgage. Although those of us living in rented accommodation don’t have that security of owning a home, the maintenance and insurance costs that are covered by a landlord build up a huge saving over the years. As many renters may already know, one of the most frustrating things about living in a rented property has to be the inability to put your own stamp on the property. While some landlords are happy for tenants to decorate the property, it’s likely you’ll need to put up with the magnolia walls, boring kitchen doors and the inability to hang any photos up for the duration of your tenancy. On the flip side, despite homeowners being able to change the look of their home as they see fit, this does come with a hefty price tag. Our study found that the average homeowner will spend around £1,448.43 on décor and maintenance over a year, with 1 in 10 redecorating their house once every year. Even though the average timescale for redecorating your home is roughly three times every 10 years, those living in Bristol were the least likely to indulge in redecorating, with 38% having done nothing to their houses in the last 10 years! If you’re a homeowner, you’ll know the pain felt in your wallet when things break unexpectedly. Three-quarters of Brits surveyed suffered at least one major house maintenance issue a year, all of which come at a cost to homeowners – but renters can breathe a sigh of relief, as these costs are covered by the landlord. 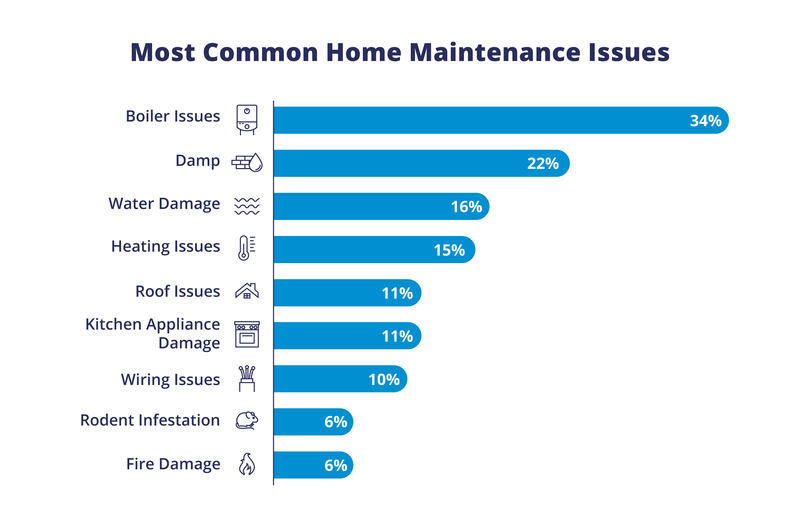 The most common maintenance repairs in the home are boiler issues (34%); damp (22%); and water damage (16%) – not a surprise when you take our good old weather into account! The high cost of these repairs mean that many of us choose to pop these costs onto a credit card or take out a loan. If you’re thinking about buying your first home, stop and think before you commit. When there’s so many ongoing costs to consider, it’s now causing many homeowners to regret entering the property market. We found that, thanks to a wide range of reasons, a staggering 1 in 10 Brits regret buying their home. Those who bought older properties in the hopes of doing them up found that damp and mould were a massive issue, while others who live in areas where new builds are popping up found that parking was a nightmare. Surprisingly, the younger you buy your home, the more likely you are to regret your property choice, with 15% of 18 to 24-year-olds and 20% of 25 to 34-year-olds wishing they hadn’t bought the house they did. There are more benefits to renting a property than you might think. By choosing to rent, you can easily move onto another house or apartment if you have undesirable neighbours or if you’ve grown tired of your surroundings. However, for some, owning a home is an important milestone which often comes with added financial benefits. Ultimately, owning your own home can be an investment which increases in value over time. Nearly a quarter (24.4%) of Brits move to a new house at least once every five years, so it could be a smarter option to rent if you like to change your surroundings often. For Londoners, there’s a huge divide in opinion when it comes to staying or going. We found that 20% of people in London move to a new house once a year, however, of the people we spoke to, only 25% of them moved once in 10 years! In contrast, those dwelling in Bristol seem to be the most content with what they have. 25% of residents haven’t moved to a new house or apartment at all in the last ten years. Whether you already rent or own a home, or you’re in the throes of deciding what to do when it comes to property, think about what options you have. If you’re looking to save money in the long run, it might not be the most sensible option to hop onto the property ladder after all!